It has $1.25 La Colombe coffee! Earlier this year, Los Angeles-based publicist Rachel Krupa opened The Goods Mart—a sort of Instagram-age 7-Eleven with a sustainable bent—and now she's bringing her luxury-snack destination to New York City. Open now at the border of Soho and Little Italy (189 Lafayette Street, specifically), the new, all black and white outpost marries L.A. best-sellers ($1.25 La Colombe drip coffee, Kelvin Slush Co. organic pineapple-ginger-kombucha slushies, breakfast burritos from Burritos La Palma—a favorite of the late Jonathan Gold) with some new, NYC-specific offerings. Alidoro's "Mona Lisa" sandwich (fresh mozzarella, artichokes, caponata, Bel Paese cheese) will be making an East Coast appearance, as will their special "Goods Mart" sandwich (prosciutto, fresh mozzarella, and a blend of sauces). A few more New York City highlights: a soft-boiled-egg-topped quinoa salad from Loosie's Kitchen, West-bourne's granola and chocolate cashew pudding, and curry plantain lentil puffs from plant-based catering company Spoon and Sprout. 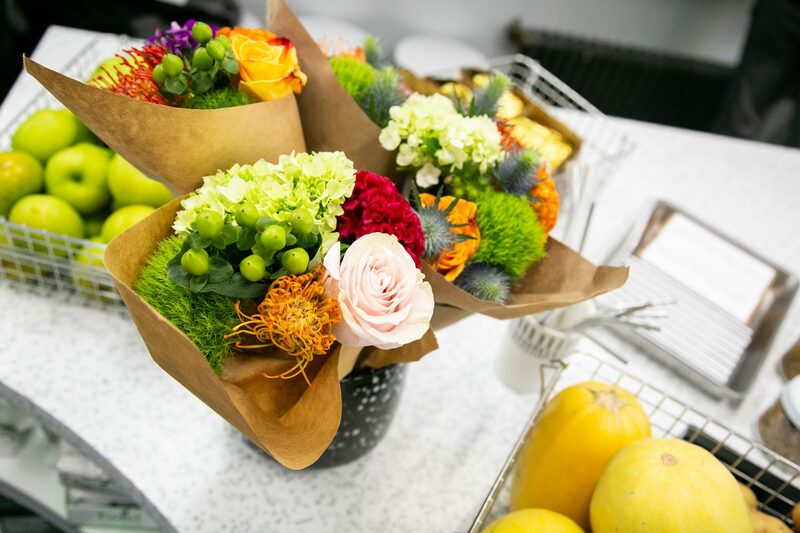 Just, like, the prettiest convenience store bouquets ever. Other grab-and-go items include Eden Foods’ roasted pumpkin seeds, Kettle chips, Tate's cookies, Matcha Bar bottled teas, and Forager's cashew yogur. In total, there are around 200 products for sale—most of them skew healthy and socially conscious, and, according to Krupa, everything was chosen with a range of budgets in mind. A Big Gulp for the Goop set. Like the original location, the new Goods Mart is committed to avoiding waste and giving back. To start, Krupa has partnered with Local Roots and Norwich Meadow Farms to offer "cosmetically challenged" (but still delicious) fruits and vegetables that might be a harder sell at more traditional grocery stores. (The shop will also carry a selection of Norwich Meadow Farms' locally-made apple sauce, honey, maple syrup, salsa, and apple cider vinegar.) All expired or too-blemished produce will be donated to the Bowery Mission—a Manhattan-based men's shelter. And, all tips in the month of October will go to the NYC Parks Stewardship Program, where they'll then be put towards planting new trees in the area around The Goods Mart.